Josh Warrington will defend his IBF World Featherweight title against Carl Frampton at the Manchester Arena on 22nd December, live on BT Sport Box Office. Warrington (27-0) became Leeds first ever world champion when he upset the odds and defeated Lee Selby at Elland Road back in May. The undefeated 27-year-old will now be involved in yet another huge domestic clash this year when he faces the current interim WBO World Featherweight champion, Frampton (26-1) subject to IBF sanctioning. “The Frampton fight really appeals to me and it will be another big scalp for me.” said the IBF Featherweight champion. “I went over to Windsor Park to watch Carl fight a few weeks ago, I wouldn’t have gone over there if I wasn’t interested in the fight. There was easier routes I could have taken like having a voluntary. Frampton and Selby in the same year would be a massive achievement. The fight will take place in neutral territory when both sets of boxing fans make the trip to Manchester on 22nd December. Both fighters have proved in recent times that they are two of the best supported boxers in Britain. Over 20,000 Warrington fans filled up Leeds United’s Elland Road in May whilst Frampton sold out Northern Ireland’s national stadium, Windsor Park in August. “I’ve done a lot more in my career than I thought I would have when I turned professional. I’m very proud of my career but I believe I still have more to give and want to keep going as long as I can. I will add my fourth world title and go on and unify again. 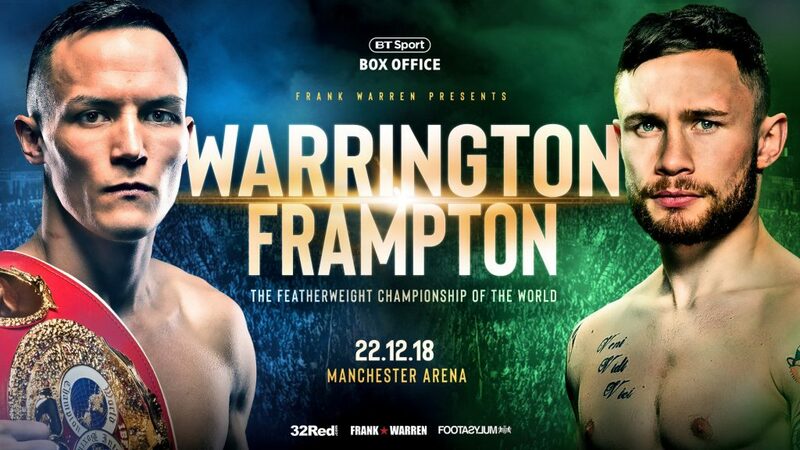 More information on how to purchase tickets for Warrington v Frampton will follow soon.